With Space Shuttle Atlantis officially set for an opening launch attempt on May 11, confirmed after today’s Agency Flight Readiness Review (FRR), NASA managers are continuing their review of a host of ‘special topics’ for the mission’s rescue flight, STS-400, which is enjoying a smooth processing flow on Launch Pad 39B. As has been reported by this site for the last two years, via over 20 articles, Space Shuttle Endeavour will be standing by on launch pad 39B at the time Atlantis (STS-125) launches on her mission to the service the Hubble Space Telescope. As such, Endeavour will undergo pad processing up to L-3 (days) activities. At that time, processing on Endeavour will stop and she will be maintained in that condition through the launch and mission of her sister ship Atlantis. In fact, Endeavour will remain on standby at launch pad 39B through the completion of the STS-125 flight crew’s late-inspection operations. Furthermore, the Mission Management Team (MMT) will discuss the flight readiness of STS-400 during their daily MMT (Mission Management Team) meetings once Atlantis (STS-125) has reached orbit. In this manner, should a LON scenario be deemed necessary by the MMT and the NASA community, approval would be given to pick up pad processing on Endeavour at the L-3 day mark, with all departments having a clear understanding of the STS-400 readiness. Furthermore, Atlantis will have consumables to support a Contingency Shuttle Crew Support (CSCS) scenario – albeit without the ‘safe haven’ of the International Space Station, which results in consumables being limited and providing “little margin” for STS-400 rescue operations. In the unlikely event that the rescue mission was required, Endeavour would be capable of launching No Earlier Than seven days after the launch of Atlantis. 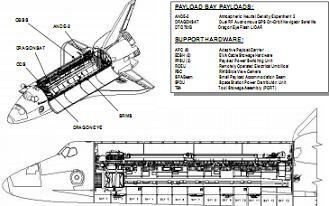 However, unlike almost all other rendezvous missions, Endeavour’s capture of shuttle Atlantis would occur on Endeavour’s FD-2 (Flight Day-2). “Launch Window duration varies and is a function of Flight Day 2 rendezvous phasing,” notes the MOD Mission Overview presentation, available for download on L2. While a FD-2 rendezvous is preferred for STS-400 operations – mainly because of limiting consumables (food, propellant, etc.) onboard Atlantis – the MOD and the Space Shuttle Program (SSP) have agreed to allow the Kennedy Space Center launch team the ability to extend the daily launch window for STS-400 into the FD-3 rendezvous timeframe, to allow additional time in the daily launch windows to get Endeavour off the ground. 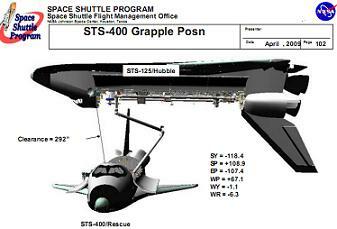 Also unlike previous flights, STS-400 will not require a TAL (Transoceanic Abort Landing) site. TAL sites are usually necessary to provide certified, intact abort modes for shuttle crews in the event of an engine/engines or systems failure. Nevertheless, because Endeavour does not require a payload for STS-400, the vehicle is light enough to ensure that the RTLS (Return To Launch Site), while the ATO (Abort To Orbit) abort mode boundaries overlap, thereby eliminating the need for a TAL abort site. As such, TAL support personnel will be released from their duties in Moron, Spain – the only viable TAL site for Atlantis on STS-125 – after the mission’s successful launch. However, should an emergency during Endeavour’s launch be declared, such as a decrease in cabin pressure or a systems malfunction, Endeavour’s crew can still make use of the emergency landing fields on the island of Bermuda and in Banjul, The Gambia. Nevertheless, those emergency landings would only be considered if the particular failure was critical enough that aborting to orbit was deemed too great a risk for the flight crew. Furthermore, the STS-400 flight will not be granted any formal changes to its Operations and Maintenance Requirements and Specifications, Launch Commit Criteria, and/or Flight Rules because of the special nature of the mission. 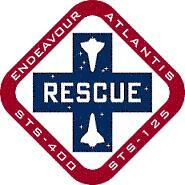 Essentially, there will be no “relaxation of requirements for launch” just because STS-400 is the rescue mission for Atlantis’ crew. However, once Endeavour reaches orbit, rendezvous preparations with Atlantis will begin in earnest. Unlike all previous post-Return to Flight missions, should Endeavour actually be launched on STS-400, the four person crew – Commander Chris Ferguson, Pilot Eric Boe, and Missions Specialists Shane Kimbrough and Steve Bowen – and will not perform the standard Thermal Protection System (TPS) inspections on FD-2. Instead, all TPS inspection related operations will be differed until after the STS-125 flight crew rescue milestones are complete. 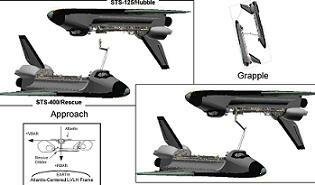 For rendezvous operations, Atlantis will be maneuvered to an orientation that places her Payload Bay toward Earth and her starboard side on the velocity bar (Vbar). Endeavour will then approach Atlantis from the Rbar (from underneath), “flying at a 90 degree angle to Atlantis to minimize RCS plume impingement effects during final braking” to a grapple range of approximately 44ft. Once Endeavour reaches this position, both Orbiters will be placed in free drift to allow Endeavour’s crew to use their Shuttle Remote Manipulator System (SRMS) to “grapple Atlantis using the forward grapple fixture on Atlantis’ berthed Orbiter Boom Sensor System (OBSS),” notes a MOD FRR presentation, also available for download on L2. After Endeavour successfully grapples Atlantis, Endeavour’s crew will nullify any rotational rates between the two orbiters. Finally, after Atlantis’ crew is safely aboard the rescue orbiter, Endeavour’s crew will maneuver the two vehicles to the proper separation orientation. This orientation will see Atlantis flying belly-first along the Vbar with Endeavour right ‘behind’ her. For separation, the MOD has approved an ungrapple time of sunrise +2minutes to ensure that the ungrapple and first part of separation occur in daylight. Should the rescue mission be launched, the Ascent/Entry Flight Control Team from STS-125 will move over to support the rescue mission while the STS-125 Orbit 1 and 2 Teams will undertake 13-hour days through the disposal reentry of Atlantis. Furthermore, the MOD presentation notes the various amounts of time Atlantis’ crew could wait for rescue if unfavorable damage is detected. If un-repairable damage is detected during the FD-2 TPS inspections, and the decision is made to conduct an immediate Group C+ power-down, Atlantis could act as a life raft for her Flight Crew for just over 24 days if needed. Similarly, should un-repairable damage be detected on FD-10 during the late inspections, and the decision is made to move immediately into Group C+ power-down, Atlantis could act as a life raft for an additional 16.5 days, with the STS-400 rescue mission arriving No Earlier Than 15 days 16 hours after the damage was detected. Nevertheless, the likelihood of STS-400 actually flying is very slim. However, Endeavour will not be officially released for her Launch On Need duties until Atlantis and her crew are safely home.